FedEx Corporation cut its costs significantly last year, and now it's ready for strong earnings growth. After years of stagnation, FedEx Corporation (NYSE:FDX) stock has bounced back in a big way in the past year. Timely cost cuts and an ongoing program to boost efficiency is allowing FedEx to post stronger earnings growth than top rival United Parcel Service (NYSE:UPS). As a result, FedEx stock has absolutely crushed UPS stock during the past year. This week, FedEx reported that it finished its 2014 fiscal year with a strong Q4. Management also projected strong earnings growth in the upcoming year. This helped FedEx shares rise 6% on Wednesday, reaching a new all-time high around $149. In late 2012, FedEx announced a plan to boost operating income in its Express division (the company's largest business segment) by $1.6 billion by the end of FY16. Since the plan was revealed, the outlook for global priority air shipments has worsened significantly. More and more shippers have become willing to accept slightly longer transit times to save money. Nevertheless, FedEx has maintained its profit improvement target for the Express division. As a result of the slower than expected demand growth, FedEx is relying heavily on cost savings to reach its $1.6 billion goal. The biggest areas for savings are cutting excess capacity, trimming headcount, and replacing older aircraft with more efficient models. FedEx made plenty of progress on the first front in 2013, as it cut cargo flights between Asia and the U.S. twice during the year. On the second front, 3,600 employees accepted a voluntary early retirement offer in early 2013. Those employees have retired over the past year, with the last group leaving the company at the end of May. FedEx has also made headway on aircraft upgrades. Last year, it added four new Boeing (NYSE:BA) 767 freighters and two new Boeing 777 freighters to its fleet. FedEx has also purchased dozens of used Boeing 757s. Last year, it converted 17 of these 757s to freighters and added them to its fleet. This allowed FedEx to retire all of its dated Boeing 727s, as well as several other aircraft. FedEx's cost-cutting moves of the past year will enable it to realize 75% of the $1.6 billion profit improvement target by the end of its new fiscal year. As a result, the company expects EPS to jump from $6.75 last year to a range of $8.50-$9.00 in FY15 (representing 26%-33% growth). Meanwhile, at UPS -- which does not have the benefit of such a broad cost-cutting plan -- profit growth has been much slower. Last year, EPS grew a measly 1% to $4.57, and UPS set an initial 2014 guidance range for EPS between $5.05-$5.30. That would represent 11%-16% year-over-year growth -- solid, but nothing to write home about given the easy comparison. FedEx should continue to grow earnings faster than the rate of economic growth in the next few years, particularly due to its aircraft upgrade plans. FedEx plans to remove 34 MD-10s from its fleet in the next two years, replacing them primarily with 767s. FedEx CFO Alan Graf has stated that replacing an old three-engined MD-10 with a new Boeing 767 saves $10 million per year. As a result, retiring old aircraft will help FedEx save hundreds of millions of dollars annually within just a few years. At this point, FedEx stock trades for more than 16 times the high end of its FY15 earnings guidance. FedEx stock is thus very unlikely to repeat its 50% appreciation in the coming year. That said, FedEx's cost-cutting program will continue to produce benefits for the next two years, boosting profit growth. 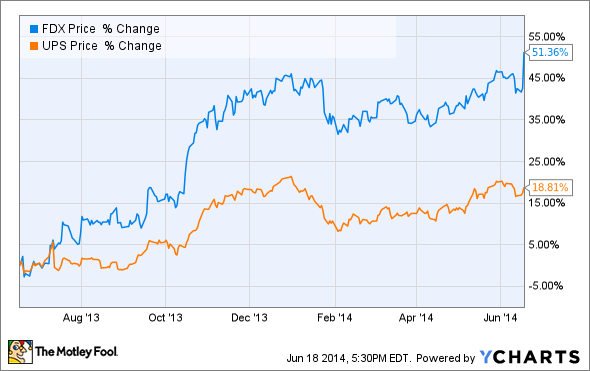 As a result, I expect FedEx to continue outperforming compared to UPS. Looking ahead, there is plenty of upside left for FedEx stock as the global economy recovers, e-commerce continues to grow, and the company continues upgrading to newer twin-engine planes. For long-term investors, FedEx still looks like a good bet.